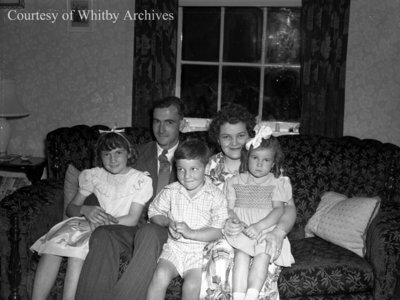 A black and white large format negative of Mr. Powell, his wife and their three children. This photograph was taken for the 35th wedding anniversary of Elmer and Adella Powell. Powell 35th Wedding Anniversary, June 4, 1948, Marjorie Ruddy. Whitby Archives A2013_040_372.